Life is full. There is much to do in paradise, though writing hasn’t been one of the things I’ve been focused on lately. Let’s just say I’ve been soaking up life experiences and calling it research! Besides hula dancing, there are all kinds of tiki drinks and bars to explore. I spend a lot of time thinking about fun things to do at Tiki Parties. 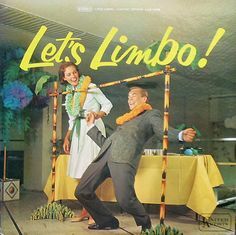 You can't beat a good Limbo contest. Lucille Ball ... always an inspiration as a Goddess. So while I’m busy living the Tiki life, I thought I’d share a sneak peek of the unedited opening scene of Book Six of the Tiki Goddess Mysteries with you. I’ll leave what kinds of “shots” to your imagination. On a lawn behind the Tiki Goddess Bar and Restaurant parking lot, a light rain misted on the line of geriatric Hula Maidens gathered beside a seven by three foot trench. The women stood shoulder to shoulder, neatly lined up like slices of a sushi roll. They all stared down into the open grave. Three of them held shared umbrellas while the others ignored the passing shower. Dressed alike in one of their most understated dance costumes, their muumuus were made of fabric with pink hibiscus blossoms scattered over an unflattering brown background. They referred to them as their “poop” muumuus. 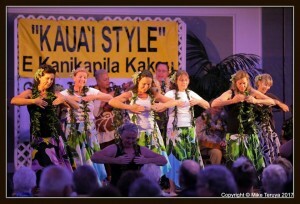 Each of the ladies had a five foot ti leaf lei draped around her neck. Kiki Godwin, the self- appointed leader of the troop of mostly over fifty, mostly haole hula dancers was afraid her hearing wasn’t what it used to be until she turned to the woman with the pink bouffant hairdo standing beside her. Kiki ignored Lillian’s theatrics and stared at the long narrow trench in the ground. Uncle Louie, owner of the Tiki Goddess Bar, donated garden space in his yard for the burial. As soon as the service was over he’d fill in the hole. Tomorrow Louie planned to plant ti and heliconia on top, hiding all evidence of the grave. Flora Carillo, the hula sister to the right of Lillian leaned around her and whispered, “You gonna say a eulogy or something, Kiki? I gotta get back to the store.” Owner of a trinket shop in Ching Young Center just down the road in Hanalei, Flora was their only hapa or part Hawaiian dancer. She turned, happy to see the parking lot jammed with cars. Big and Little Estelle, a mother and daughter who were dancers and artists from Princeville had painted a banner and hung it in front of the bar on the highway announcing the time of the memorial, inviting locals and tourists alike to stop and pay their respects. Always energized by an audience, Kiki reached up and patted the flower studded chignon atop her head, licked her lips, put a smile on her face and thought, it’s show time! As if on cue the drizzle stopped falling, the trades blew most of the clouds away and the sun made a partial appearance as it dipped toward the horizon. Kiki carefully threaded her way around the open grave. She craved attention but figured toppling into the trench and landing on the dearly departed might be a bit over the top. The Maidens with umbrellas folded them up and shook raindrops off over the trench. The crowd gathered behind them consisted of tourists snapping photos. There didn’t appear to be any locals in attendance, which wasn’t surprising seeing as how most folks had a love/hate relationship with the departed. Uncle Louie Marshall, owner of the bar and the house on the beach stood off to the side beneath the eaves of his house and leaned on the long handle of a pointed shovel. In his mid-seventies, Uncle Louie wore his usual bright aloha shirt, white Bermuda shorts, a kukui nut necklace and a Panama hat. Kiki gave him a nod and a wink, looked down into the grave to compose herself, took a deep breath, then raised her head. She scanned the crowd assembled across from her. A loud choking sound escaped Lillian. She jammed another Kleenex against her mouth. Kiki went on. “We knew them well. Many of us watched them grow up. Red, Gimpy, Fluff, the Kernel, Whitey, and Chicken Little lived long and happy lives here behind the Goddess. They were always darting in and out of the hedge, fighting over scraps and road kill, dodging cars and posing for photos. Uncle Louie pampered them. Surprised by a sudden flood of tears, Kiki attempted to stem the tide by blinking them away without loosening her false lashes. Somewhere down the highway a rooster crowed. Tourists pressed closer. One man took telephoto shots of the bodies lined up in the grave. With the sun out from behind the clouds, the air was heating up. Kiki realized she’d not only started to perspire, but she’d worked up quite a thirst. It was cocktail time. Time to speed things up. Afterward, as Kiki walked around the grave to join her hula sisters, a trim blond female tourist in a nautical striped Polo shirt and navy shorts, pulled her aside. “Probably not,” Kiki agreed. Droplets of sweat slid down her face, making it hard to focus. “Thanks for coming.” Kiki tried to move around the tourist so that she could head for the bar. Let me know what you think of the opening scene by leaving a comment below. THEN CLICK ON TO THE HOME PAGE of THIS website and add your email to the NEWSLETTER sign up at the BOTTOM OF THE PAGE. Ah, Tiki Goddess! An intriguing beginning! Can’t wait to read Six Shots! I can only imagine what Kiki and the Hula Maidens will do on THIS important case! More drinks!